If a spoonful of sugar can help the medicine go down, just how much can a personal umbrella do! Almost 85 years Mary Poppins’ character was first created by British writer P.L. Travers and 55 years after the release of the Disney classic, the sequel movie, Mary Poppins Returns hits theatres this Christmas. For many of us, now parents, Mary Poppins was a childhood figure, teaching us how the mundane could become magical. In Mary Poppins Returns, the magical nanny who swept into the Banks family home on Cherry Tree Lane returns to help the next generation of the Banks family rediscover the joy and wonder that is missing in their lives following the loss of Michael’s wife. The film evokes a power narrative of the resilience that is possible when we are equipped with the right coping skills. When we think of Mary Poppins, one of the most iconic images that comes to mind is that of her holding her umbrella to the West wind and letting it lift her away. Her parrot-head-handled umbrella played a major role in revealing her super powers to the Banks children. Mary never left home without her umbrella, always prepared for a chance of rain. In fact, she embraced the storms and found delight in using her umbrella. We can learn a lot from her wisdom. Challenges, struggles and setbacks weave their way into the fabric of life, just the same as rainy days do. Life isn’t always sunny and we all face the inevitable rain at times. We also all have our own umbrella, build from the emotional intelligence and the skills necessary to weather life’s storms. Mary Poppins taught us that it is possible to be prepared. Just as she nannied and nurtured the Banks children in a magical, yet intentional way, we can support our children in expecting and preparing for life with an umbrella of coping skills that will get them through whatever inclement weather lies in their path. Like us, our children are not immune to life’s challenges and inconsistencies. Even with our best efforts to protect them, they will inevitably face difficult days scattered in with the good ones. From the light drizzle of failing a test, fighting with a friend or facing a strict teacher; to the downpours of illness or losing those we care about, we are all destined to face life in all of its capacity. One of the greatest gifts we can give our children are the life skills necessary to handle these unexpected setbacks: their umbrella. Umbrellas are an essential part of helping us take on life, learn from our failures and come out the other side with an even bigger umbrella that will protect us the next time life rains. Without an umbrella we are left anxiously waiting for the next rain storm, instead of feeling empowered to cope with and grow from life’s inevitable challenges. Just as we can’t control the rain, facing challenges isn’t an option. It’s a normal part of the human experience. This principle is about understanding that every single one of us faces rain at some point and that this in fact is normal. Knowing this changes the perspective our children have when facing stressors. When we feel part of a common human experience, instead of feeling isolated, it downgrades the severity of the rain and builds self-compassion for our imperfections. Mary never made the Banks children feel that a series of bad things were happening to them; she made it a natural fact that they’d learn how to take on a life with all kinds of varied weather. [Parenting tip] Normalize the rain for your child. Your child’s personal narrative about what challenges mean is a powerful predictor of how well they will get through them. As parents, we tell them what challenges mean when we react to their experiences. Coping skills are built through facing challenges and practicing of these important skills. There is no greater practice than first-hand experience, and the more we practice, the stronger our umbrella gets. Little umbrellas work okay when it sprinkles, but when the big storms hit, we need to ensure our children have taken on little challenges along the way to prepare (to build their coping skills). Mary Poppins message is clear on this one: “A spoonful of sugar helps the medicine go down.” She was never about skipping the medicine all together! When we over protect our children from life’s struggles, we are essentially skipping the medicine that will keep them well prepare them for life. Teaching coping skills – the umbrella skills – will give our kids the sugar that will help life’s medicine go down. Our umbrella is built from research-based coping skills that help to protect us from life’s challenges and actively pursue life’s opportunities. These skills include gratitude, empathy, authenticity, grit, a growth mindset, resilience, purpose, kindness & cognitive flexibility and they are the sugar that help the medicine of life go down. Mary was always prepared for a little rain and we can be too. [Parenting tip] Anticipate the rain and proactively teach the umbrella skills. They are the sugar that help the medicine go down. Principle 4: Umbrellas without holes work better. All of the umbrella skills work together to help us in all kinds of weather. The more complete our umbrella is, the better it will work for us. Mary was a master at umbrella repair, finding a way to help the children bounce back (find resilience) in the face of any challenges. [Parenting tip] Evaluate your child’s umbrella of coping skills. Help them recognize the strong parts and parent to help them repair “the holes” (build the lacking skills). Feeding our brains is important and has a huge impact on our ability to cope (to have and know how to use our umbrella). Our energy is built from the food we eat, to our sleep, our exercise and what our senses take in. For example, most of us have watched rain become unbearable for our child when their blood sugar is low, so proper nourishment is vital. From laughter to sleep, the songs of Mary Poppins exemplify her ability to recognize the importance of what was happening under Jane and Michael’s umbrellas and fill their brains with what they needed to better weather their lives. Mary seemed to have a firm grasp on the prescription that many doctors now give to improve our ability to cope with stress and increase our resilience: time in nature. [Parenting tip] Never underestimate the powerful role of brain food in the coping equation. When thinking about your child’s ability to cope with stress, look under their umbrella too. Is their brain being fed what it needs to hold up their umbrella of coping skills? Principle 6: Some storms are too big for one umbrella to weather. Strong communities have lots of umbrellas. That way, when someone needs so extra shelter and support, there is lots to go around. And when that person’s storm has passed, they will be able to use their umbrella to help others. Mary had a knack for floating into the Banks lives, umbrella wide open, at a time when extra shelter and support was needed. Ultimately, her purpose was to help them build their own umbrellas. As the family begins to thrive on their own, we see Mary gradually withdraw her umbrella. 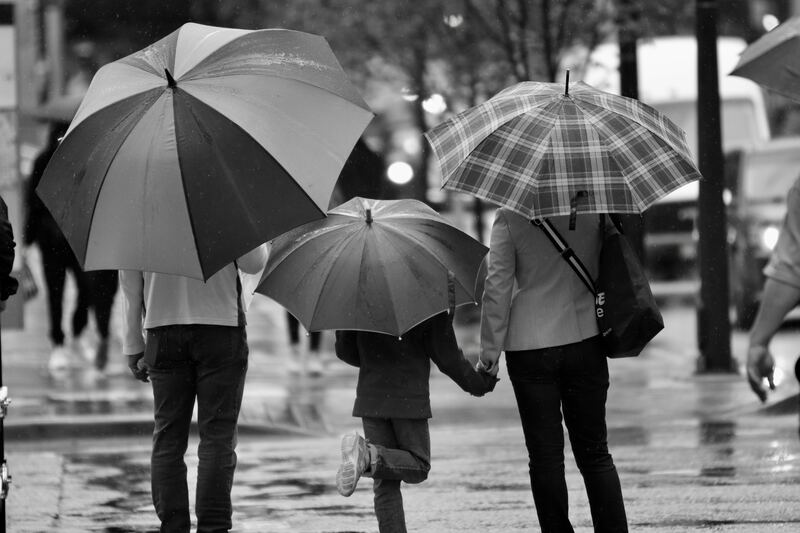 [Parenting tip] Think about when your child needs your extra shelter and when you should gradually withdraw our protection and let them handle the rain on their own. When our children are little, they depend on us for protection and without this, the implications on a child’s development are devastating, but the goal of parenting is to get our children to the point where they aren’t dependant on our umbrellas to thrive. Principle 7: Our umbrella is predictive of our future success, so we want to be sure we have our own umbrellas. When we rely on other people’s umbrellas, it places our wellbeing in their hands. People who have strong coping skills are more likely to be happy and successful in pursuing their dreams. They can actively take on the challenges, instead of watching life pass by through their window. When Mary arrived, the banks children watched her timidly through the bannister; when she left, they were singing, laughing and flying kites. They were ready to take on life with zeal. [Parenting tip] Don’t over-focus on academics as the only type of success. It is the umbrella skills that prevent our children from watching life through the bannister. Mary Poppins is portrayed as an astute and confident woman who believes in possibility. As parents, we want to portray possibility in any weather. We want our children to be able to take on life’s opportunities and to navigate the challenges. In empowering our children to build their umbrellas (and by leading by example in using our own), we can help them confidently pursue life’s opportunities in any weather. We help to create that “magic spoonful” of ingredients that makes the difficult times more digestible. Dr. Jen is the CEO and founder of the Umbrella Project, a school curriculum and parenting program designed to create a profound paradigm shift in our understanding of personal well-being and to empower parents, teachers and children to choose wellbeing, even on the rainy days. She has worked extensively with schools and organizations, shifting the way we are preparing for life's inevitable rainy days and building the powerful coping skills necessary for health and happiness.